You are here:Home-Authorisation is issued: what do I do next? Authorisation: What does it mean? This is the legal document that allows you to issue Court proceedings. They are unable to deal with your case. This can be for a variety of reasons-perhaps the Respondent (person you hold responsible for your accident) was not correctly named, or their address was not correct or there is some important documentation missing from your application such as a medical report or your fee was not paid. If this happens it is important to contact us immediately as the time in which to take your case to Court is running against you. It may be necessary to complete your Application correctly and re-lodge it with the Injuries Board. They have assessed your case. Once the Injuries Board put a value on your case they will inform you and the Respondent of amount of the Assessment and then you have 28 days in which to accept or reject the amount of the assessment and The Respondent (other party) has 21 days in which to accept or reject the assessment. Once you get your Assessment you should contact us immediately and we will assist you in evaluating whether you should settle your case at that time and whether the assessment is a fair offer for your injury and losses. If the assessment is accepted by both the Applicant and the Respondent then an Order to Pay the assessed amount issues from the injuries . If either the Applicant or the Respondent refuses the assessment then the Application is released from the Injuries Board. When the Application is released you are provided with an Authorisation and it is necessary to keep this document safe as it will be needed when court proceedings have to be issued. If you have received an Authorisation, you should contact us immediately. There may be a question about liability i.e. who is responsible for your accident. People don’t realise (and the Injuries Board Never tell you), that the person/legal entity liable to compensate you, may agree to have your case assessed by the Injuries Board,, wait on your assessment and then turn around (after 9-15 months) and reject the assessment and deny liability. You, who acted in good faith, are then left in the position that you need to instruct us to issue Court proceedings, but during the 9-15 months Injuries Board process, vital evidence that is essential to prove your case will not be preserved. Instructing us immediately will ensure this does not happen. Investigations could be ongoing regarding your accident. 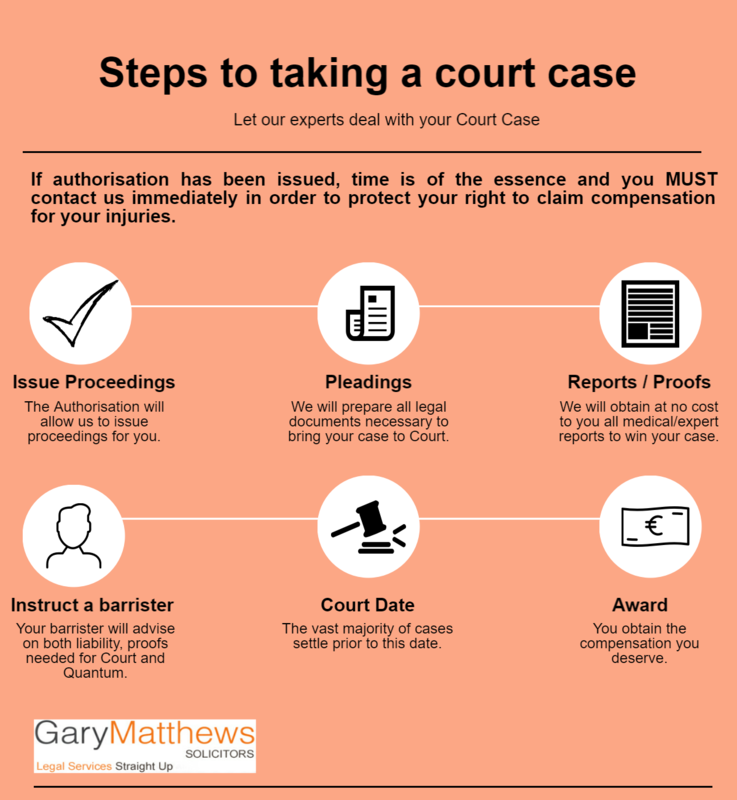 It is important that you contact Gary Matthews Solicitors immediately and we will explain to you why your case was released and what you should do next. You usually have two years from the date of your accident to lodge and have your application acknowledged by the Injuries Board. When your case is released by the Injuries Boards other time limits apply and it is important to take legal advice from us as soon as possible to avoid the time limits expiring. If the time limit expires, your right to issue court proceedings expires. We will be able to advise you why your case was released from the the Injuries Board, whether you have used the correct legal name of the Respondent in your application, whether you have included all potential respondents, the merits of your case, what difficulties there may be with liability, the value of your injury and losses or whether further investigations should be carried out. Furthermore we will advise you of the costs and outlays likely to arise in bringing proceedings, and your chances of success or failure in any potential proceedings. We will also ensure you recover your entire out of pocket expenses and that you have valid proof of all such expenses. We will then fully brief a Barrister with details of your case – the circumstances, the other parties involved, the injuries and out of pocket losses incurred. Your Barrister will evaluate your case again and give you the benefit of their further advices and will draft the relevant proceedings. We will review the proceedings with you and they will be issued in the Court that best reflects the value of your case – District Court up to €15,000; Circuit Court over €15,000 and up to €60,000 and the High Court for cases worth in excess of €60,000. The vital thing to remember, is that once the Injuries Board issues an Authorisation in your case, time is of the essence and you MUST CONTACT US IMMEDIATELY in order to protect your right to issue court proceedings. If you delay and the time limit to issue proceedings has expired, there is nothing we can do for you. Don’t let this happen. Over 90% of claimants use a solicitor.